Car Wash, oil, 36 x 30. Five vintage toy trucks, all gently worn by decades of play, hang against a wall, each vehicle suspended from a clothesline by a snip of twine and a wooden clothespin. 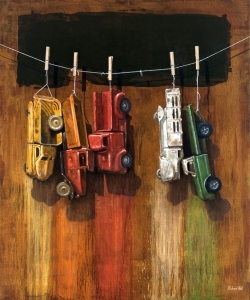 Down the wall, in streaks of yellow, orange, red, white, and green, the trucks’ colors inexplicably run, as if the playthings were made not of metal but of non-colorfast fabric, forming an engagingly abstract backdrop to the impeccably realistic objects. Add to the recently completed canvas the title, CAR WASH, and you have the quintessential experience artist Richard Hall aims to deliver. 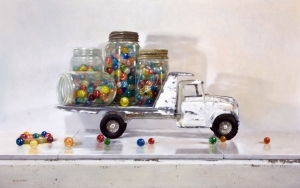 He renders his still-life subjects with a precision that makes viewers feel they could reach into the painting and grasp them. But the appeal of Hall’s oils goes beyond their technical mastery alone. From initial concept to composition to final execution, the British-born, Arizona-based artist adds a healthy dose of playful humor that can make his works irresistibly engaging and thought-provoking. Hall has always viewed the world through different eyes. “I had a really freewheeling childhood,” says the 59-year-_old of his early days in Ilkley, a town in West Yorkshire, the scenic, gently rugged landscape featured in the novels of the Brontë sisters and, more recently, veterinarian James Herriot’s All Creatures Great and Small books and TV series. 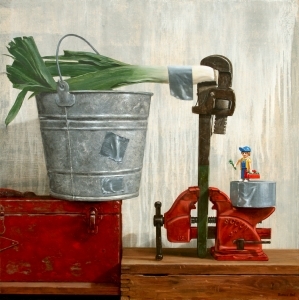 Fixing the Leeks, oil, 24 x 24. Hall’s own childhood tools tended more toward colored pencils and pads of paper. “At night, back in the days when we didn’t have TV, I would sit at the kitchen table and draw,” he says. “I was good at it, and I was praised for it.” In school, Hall’s talents regularly won him awards and prizes in the form of bookstore gift certificates he would redeem for tomes on painters, from Dutch 17th-century master Jan Vermeer to early-19th-century English Romantic landscape painter John Constable. Losing My Marbles, oil, 12 x 24. From there, Hall went on to Kingston Upon Hull Regional College of Art and Design for a three-year bachelor’s degree, majoring in painting. The early ’70s were a time of creative tumult, and that influenced his education. “Punk rock was starting. Conceptual art was taking off. They were throwing out a lot of the traditional methods and courses, and I jumped right in it, doing conceptual and abstract work.” Four decades later, he regrets not having had a more rigorous, atelier-style training, but he also sees some advantages to the education he got: “I think it gave me a freedom of thinking that I might not otherwise have had.” Still, practicality reigned. After graduating and spending a year back home in Ilkley, Hall enrolled in a yearlong program at the Brighton College of Art to earn an art teacher’s certificate. Though he completed the course, Hall’s time near England’s southern coast played a far more important and unexpected role. On his birthday, September 28, just after he arrived on campus in 1977, he went for a walk and met Sharon, an exchange student from Arizona. “It sounds kind of corny,” he says with a laugh, of their love at first sight. When the school year ended, he moved with her to Phoenix, where they married that July. Almost 34 years later, they’re still happily together, with two grown sons and four young granddaughters. Everyone Has to Chip In, oil, 16 x 20. A major turning point occurred at 11 o’clock one night in May 2006. While enjoying the night sky in his backyard, Hall felt a pain in his throat, a tightness in his chest, and a tingling in his arms. He went inside and told Sharon he needed to get to the hospital. Gradually, those compositions began to evolve from traditional arrangements of vases, tableware, flowers, fruits, and vegetables into something more skewed, expressing Hall’s British sense of humor. He distinctly remembers a key moment in that process. To Bee or Knot to Bee, oil, 12 x 24. Hall began to haunt antique stores, ever on the lookout for interesting things to include in his paintings: old alphabet blocks that, in jumbled configurations, sometimes spell out a punning title; wooden pull toys; bits and pieces of Mr. 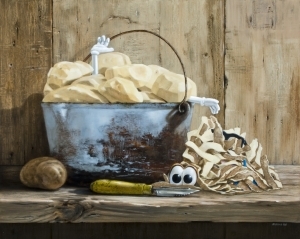 Potato Head, which he might poignantly insert amidst a toy truckload of real potatoes; Barbie Dolls, favorite toys of his granddaughters, which sometimes play the same naively “naughty” role a comely actress might fill in a Benny Hill sketch; those battered trucks; and, of course, lovingly timeworn tools and toolboxes that look as if they might have been passed down from his grandfather’s workshop. Legacy Gallery, Scottsdale, AZ; Roby King Galleries, Bainbridge Island, WA; Principle Gallery, Alexandria, VA; www.richardhallfineart.com.